Los Angeles, CA, United States (4E) – Miley Cyrus was reportedly given an ultimatum by her rumored fiancé , for the second time around, Liam Hemsworth , that if she does not stop smoking pot, their supposed wedding will not be pushing through. The actor reportedly has offered his help for Cyrus so she could slowly quit marijuana. However, the “Wrecking Ball” singer is rumored to not wanting to stop anytime soon. 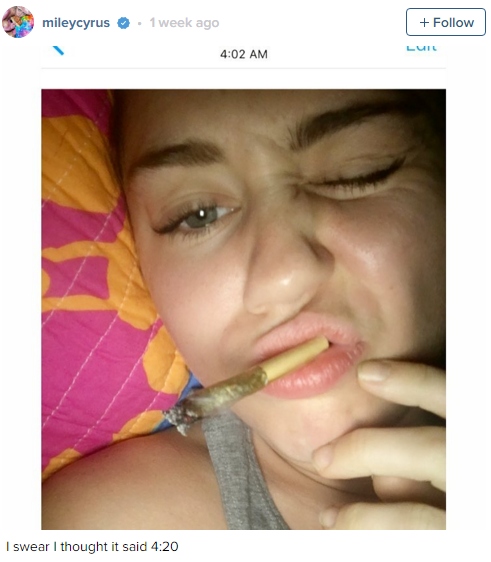 Back in the 2015 Video Music Awards of MTV, Cyrus said that she loves marijuana and it seems that her devotion for the drug has become all the deeper. She has also been posting photos of her smoking the drug on her Instagram account. This has reportedly made the relationship of the two strained. Despite the reports that Cyrus and Hemsworth are having troubles in paradise, the singer has been seen arrive in New York wearing her diamond engagement ring. This is one of the rare outings of Cyrus since it has been reported that she has transferred to Hemsworth’s Malibu home. The ring was the same sparkler that she received from Hemsworth the first time that they got engaged. The two have just recently reconnected during the New Year’s holiday after splitting back in 2013. They have never confirmed nor denied the reunion rumors. Multiple sources are saying that Cyrus and Hemsworth also got married in secret during a private wedding ceremony on a beach in Australia. They were also reportedly seen kissing and holding hands during a January 8 Golden Globe party at West Hollywood's SoHo House. The two are yet to comment on the validity of these reports.